Part marker, part brush, and part container, these waterbrushes feature flexible nylon brush tips and squeezable barrels that allow water, ink or other wet mediums to flow evenly and effortlessly with a touch of the hand. The brush tips can produce strokes from fine to big and bold, allowing for endless creativity. Ideal for painting on the go; they can be filled with water and used to smooth and spread color of traditional watercolors, watercolor pencils, ink and more. The can also be filled with ink or other wet mediums and used as brush marker. 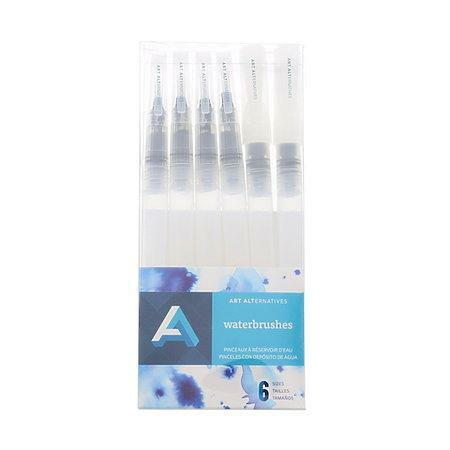 This 6-brush set includes three flat and three round empty waterbrushes in varying sizes.